Yu Teik Lee played a musical game with the audience. He performed Twinkle Twinkle Little Star, and invited the audience to shout an emotion during the performance. Immediately, the audience took part, and someone shouted "Happy", and he played it in the style that matched "Happy". Next, someone else shouted "Angry" and his notes became forceful. Someone even shouted, "Sad"! What a fun and interactive performance! We all were excited to have Benyamin Nuss to be here -- connecting and chatting with many Pianovers!. Not only did he perform "Paraphrase de concert sur Rigoletto, S.434" by Franz Liszt, he also showed us a few pieces from Final Fantasy! We hope to have more concert celebrities mingling and engaging with our local piano community! From Pianovers Meetup #101, we will explore the versatility of the piano with additional instruments with Ensemble Performances. And we had two ensemble performances tonight! The first was a vocal performance by Kendrick Ong (piano), and Siew Tin (vocals). The second was by Rei Tan (piano), and his piano teacher Fion Teo (flute). We even heard from Peter Prem, that his son, Joshua Peter, might bringing along his bass guitar for an ensemble performance with piano soon! You're surrounded by family, and friends here today at Pianovers Meetup. Not only has the piano brought all of you here at the same place, it has given all of us the chance to get to know each other, to celebrate music together, to be proponents of piano music, to appreciate each other, to discover the local talents among you, to support each other, to stand together, to create wonderful memories together, and to create miracles together! Let's take a moment to thank Kendrick for helping out with the Halloween decorations at Piano Park today! Together with Xin Hui, he started to decorate the place for the occasion at 5pm. Everyone applauded passionately for Kendrick in recognition of his enthusiasm, hard work, and professionalism. With this in mind, it is incredible to see many passionate Pianovers in our community, doing their part to make every Meetup as cheerful and merry for all of us and we all are very proud to be part of Pianovers. The new Pianovers T-shirts is now available for purchase at ThePiano.SG, and it features the Pianovers’ metronome logo on the front, and the hashtag “#pianovers” at the back. Pianovers can now be ambassadors for piano music! And, did you already know about the new format to the weekly Meetups, starting from Meetup #101? Read all about the new format and related FAQs. Pianovers who had watched John perform before would have remembered his unique way of playing: Leaving his handphone on the piano’s book stand as it played the music video of the piece he was playing, listening to the video with earphones, and playing by simply watching the video and not relying on any music score! Pianovers are invited to bask in the atmosphere with their Halloween costumes and props, and to present pieces related to the occasion on 28 October (Meetup #99). In the spirit of the event, Pianovers can feel free to have a round of ‘Trick Or Treat’! However, Pianovers are advised to consider and plan their costumes with children in mind, as our Meetups are kid-friendly – we wouldn’t want to scare little tots away! That said, we can’t wait to see and hear what our Pianovers have in store for the themed Meetup. In 2006, Derek Amato hit his head hard on a concrete floor in an accident. Although he suffered a severe concussion that resulted in partial deafness and memory loss, the experience unlocks the musical genius in him. He had never played the piano. Now, he became a pianist and composer, going on to play beautiful pieces to various audiences. He is one of the rare few individuals who experience what is known as acquired savant syndrome. As the Pianovers Meetup soon approaches its 100th Meetup, the weekly session will see exciting changes to its format. Yong Meng announced that from the 101st session onwards, Pianovers can invite their fellow music-loving friends to perform as vocalists, violinists, or be part of an ensemble or band, together with Pianovers. With the Meetup happening on the eve of Mid-Autumn Festival, 23 September, the event was nonetheless themed according to the festivities. Some took the opportunity to dress their best (we had a couple of Pianovers adorned in Cheongsams) while others, brimming with excitement, were taking group photos to commemorate the special evening. It also brings us immense joy to see many regular Pianovers return and even bring new friends along to celebrate the occasion with us. We are so heartened to see our community grow from week to week, where last Sunday was like a big family party! Today's Meetup saw Erika and her family arriving early to share homemade mooncakes made by Erika’s mom, Winny! Thank you! It is so generous and kind of you to share them, and to even personally deliver them to us. Also, Jeslyn is back with her father, Peter Prem. It was encouraging to see both dad and daughter of (what we know them as) the fun-loving Boogie Woogie family, back at our Meetup again! The Mid-Autumn Festival is drawing near! To soak in the mid-autumn atmosphere, Pianovers are encouraged to join the pot-luck gathering on 23 September and bring lanterns, mooncakes, and tea. It shall be a relaxing Sunday evening of delightful music and delicious refreshments. Tonight, we had a whopping number of piano teachers – eight in all! It's great that teachers are bringing their students to Pianovers Meetup. This out-of-classroom experience and exposure are invaluable in helping them to gain exposure and interact with other piano lovers, both of which are beneficial to their learning process. Pianovers Meetup happens every Sunday at Urban Park @ URA Centre. Waves of the Danube, by Ion Ivanovici, is a very popular and recognised Romanian tune composed in 1880. It even made its way into a Korean song - In Praise of Death, which was recorded by Yun Sim-deok in Osaka in 1926. Sim-deok met and fell in love with a Korean married man there. They boarded a steamship headed back for Korea but, sadly, jumped together to their death while on board. Teik Lee performed a mashup of two pieces this evening. He did not announce the names of the songs he would play, leaving the audience to guess them after he had finished his performance. He also jokingly added that the first piece was somewhat related to the Seventh Month; he was alluding to the ongoing Hungry Ghost Festival. It is always fun to have quizzes during Pianovers Meetup, to liven up the mood and make the performance more interesting. The movements of world-renowned dancer Kaiji Moriyama's dancing on stage were translated into musical notes on a Yamaha Disklavier player piano, accompanied by the Berlin Philharmonic Orchestra Scharoun Ensemble, demonstrating how artificial intelligence has made its foray into the world of music, in a whole new creative manner. It was a special NDP-Themed Meetup today, being the session just before Singapore’s National Day! Thus, it was not surprising to see most Pianovers dressed in red tonight. We had a number of Pianovers who played familiar patriotic tunes and definitely brought us together even more. Happy 53rd National Day, Singapore! Again and again, the experts from Steinway & Sons set off on the thrilling search for extraordinary veneers, ensuring that new models can be created in strictly limited editions. They open up precious natural treasures – occasionally a whole tree trunk is needed to create just one grand piano, which can never be repeated. I-Wen, 5 years old, has been improving! This evening, she was able to introduce herself very well and the pieces that she was going to play. She is now able to speak very confidently, and was very happy after her performances. Pianovers saw her jumping up and down multiple times. We were all very happy for I-Wen and are glad that public exposure has done her lots of good. Keep it up, I-Wen. We will support you during your piano-playing journey! There are times at 5pm, when Yong Meng arrived at URA Centre and Mr Tan was already there. Upon seeing Yong Meng pick up the dead leaves in the premises, he took the initiative to assist. This evening, Yong Meng shared with everyone that Mr Tan is one of the silent heroes behind Pianovers Meetup. The fact that the venue is always clean when everyone arrives is also because of Mr Tan's numerous efforts! Thank you so much, Mr Tan, for helping us make Pianovers Meetup a much more enjoyable event! Jeremy Foo delighted the crowd tonight with a Fugue by JS Bach. Last week, Jeremy played its accompanying Prelude. Recently, we have seen many Pianovers playing Bach's Preludes and Fugues. It would be interesting to see all 48 Preludes and Fugues played by our piano community! As an additional note, 3% of the 1,700 public performances by our Pianovers are Bach's compositions! Backing Singapore’s Top Young Pianists With "I Play Yamaha"
A new initiative to promote young Singapore piano talents will be launched this July by leading Japanese multi-national corporation Yamaha. 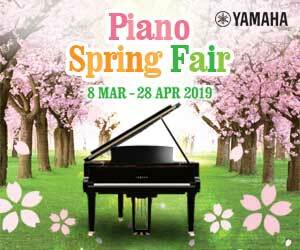 Called "I Play Yamaha", this initiative by Yamaha Music (Asia), aims to showcase and promote young piano talents aged between 13 and 25 years old in Singapore.